My name is Lloyd Ledbetter and I am the best lawyer New York criminals can buy. I'm focused and determined. Nursing my broken heart for the last few months, I've stayed away from anything that could resemble a relationship. My name is Luke Gunner and I'm the best money launderer criminals can buy. With an IQ reaching the status of genius, I can practically make money without breaking a sweat. Settling down was never a priority especially when I had so many options laid out in front of me. 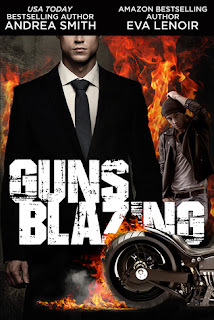 Andrea Smith and Eva LeNoir deliver a quick short MM read in Guns Blazing which is a spin off from their hilarious MM book, Black Balled. But what this book lacks in pages it makes up for in content. While this is not as funny as Black Balled it is more an intense ride, these two men were definitely intense. Lloyd Ledbetter was the lawyer in Black Balled that Larson Blackburn was seeing before he met Troy Babliona. Guns Blazing is his story and how he overcomes the sudden loss of Larson and finding love when he least expected it. Lloyd was a fantastic lawyer with a reputation for getting the job done, even the hardest of cases never fazes him and where others would walk away he gets stuck in. None more so than when Luke Gunner walks in. Luke Gunner was a…hmmmm…well just what was he…under the guise of a video shop owner he was a consultant to the lower echelons of society, the men that no-one wanted to do business with. He was a money launderer by trade, kept no records whatsoever, everything was in his head. This man never forgot a thing. Now being set up for murder of a man he has never even seen the odds are stacked against him. Condemning forensic evidence is their biggest asset to finally put Luke Gunner away, but how did it get there and where did it come from? When the cocky and arrogant Luke Gunner first walks into Lloyd’s office he is immediately on the offensive and doesn’t want to take the case on. The more though that Luke wheedles under Lloyd’s skin he realises it is a lost cause. Luke brings the dormant urges of Lloyd firmly to the surface, the ones that haven’t been seen since Larson and while he puts up a valiant to stave Luke off, he doesn’t stand a chance. Andrea Smith and Eva LeNoir deliver a mystery type read as Lloyd goes up against the police and FBI to save his new boyfriend. Turning detective and putting his life on the line as well as his reputation, Lloyd is a man on a mission. It was great to see Lloyd’s walls come down and see the man behind the suit. While these two were chalk and cheese they really brought out the best in each other. While it was a case of insta love it is expected in a novella and even though their fall was quick, it was believable. I became totally invested in their story and was championing these two along. I would have loved to have spent longer with these two and by the end wished that this was a full length novel. These two were two men that got firmly under my skin. Andrea Smith and Eva LeNoir deliver another smoking hot MM that has something for everyone. As I said above, although this was a novella it packed punches. Fast paced, highly entertaining and emotionally captivating these two left nothing out. This story was totally consuming from first till last page and kept my avid attention throughout, all I was left wanting was for there to be more. I didn’t want their story to be over. Another fantastic read from Andrea Smith and Eva LeNoir.